T-Mobile is unveiling an application for Android USA users that will provide so much in just few taps. If you live in the U.S., you must have to get this app. The app is known as “More for me”. 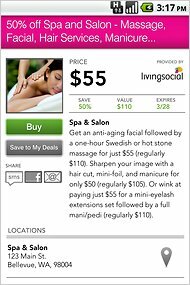 The app features group deals with a wide variety of categories that will be from anything like upscale meal offers, clothing offers, beauty services and many more. You can even get the offer related to any concert happening there. If you have liked some deals, you can always save them or you can share it with your friends too. You can choose Facebook, email or a text message as your source of sharing. Mr. Duea who is the senior vice president of T-Mobiles U.S. has said that this app shows that the company is finding new ways to make money. So, next time, when you plan to go out, you should first look at the deals and offers nearby you. T-Mobile is planning to preload this app in the future handsets. They are also working on it to release its BlackBerry and Windows Phone versions.